The largest and most visited museum in the world, the Louvre, is a Parisian icon not to be missed. On this very day, the 10th of August in 1793, the Louvre was officially opened with 587 paintings on show. 222 years later, the Louvre houses over 380,000 pieces of art and receives 15,000 visitors a day from around the world. In 2014 alone, 9.3 million visitors passed through the doors of the Louvre. We love this infographic by the Paris Pass (www.parispass.com) and its 20 Interesting Facts about the Louvre! Did you know that the Mona Lisa was actually stolen in 1911 and returned two years later..? Ideally, first thing in the morning is the best as you'll beat the crowds and you'll have more room to move around inside the museum. You'll also be able to take that picture of the Mona Lisa without a million heads in your way. If you aren't a morning person and will realistically end up coming mid-morning like the rest of the world, try for lunch time or later in the afternoon. Those you came early might leave for lunch and others might decide to come after lunch leaving this window of opportunity just for you. And of course, if you are under 26 then I would recommend Friday evening as it will be, free..! What if I'm not really into museums? If you are in a rush and/or aren't really a museum person, I would still recommend dropping by to have a look at the architecture - even if you don't step foot into the actual museum. Cross the road from the Palais-Royal Musée du Louvre metro exit. Enter the Louvre. You'll be able to get a feel and also glance into the rooms through the glass windows into the rooms with the sculptures on display on your right. Keep walking straight ahead and go under the arch to access the courtyard with the Pyramids. Take a few snaps then walk over to the Arc de Triomphe du Carrousel to see the artwork underneath the Arc. Walk over to the Carrousel du Louvre entrance, take the stairs down and check out the mini shopping centre downstairs. See the inverted pyramid. Line up to go through security and get into the centre of the Louvre where people buy their tickets. Take a stroll around before going up the escalators to exit from the glass Pyramid exit. Some beautiful photos can be taken here of the building of the Louvre seen through the glass Pyramid walls. The Louvre's staff once went on strike in 2013 in protest of the amount of pickpocketing that went on at the world's most visited museum. There are signs everywhere and unfortunately with free entry for anyone under 18, there will be those entering not just to admire the artwork but also to admire the contents of your pockets. Having said that, the situation has improved since 2013 so don't let it make you paranoid. 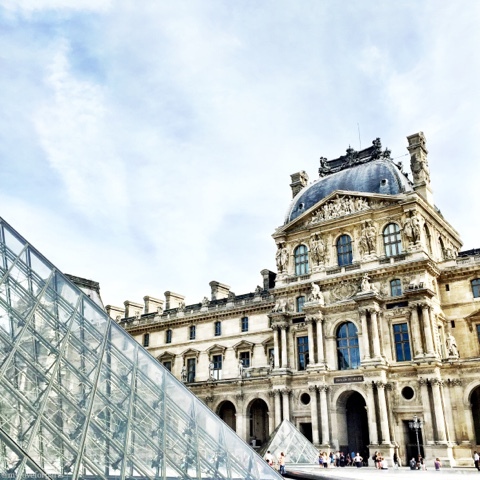 There's so much to see at the Louvre, so don't try and do it all. With over 380,000 pieces of artwork at the Louvre, even if you were to spend 30 seconds viewing each one, it would take you 100 days to get through them all. Pick a few must-sees and then make sure you spend some time just wandering aimlessly, it's my favourite way to visit a museum. Allocate breaks for food and for sitting down. Museums can be intense especially when there are crowds involved. Don't let it ruin your experience!